As we freeze in the grip of the British winter, isn’t it a nice thought that all around the UK are fine hotels where cosy lounges, freshly made beds, plump pillows, and sweet dreams are but a stroll away from a seriously good dinner? There is nothing quite so nice as rising from a great meal, replete with fine food and wine, knowing that bed is but a footstep away.Sadly, the British hotel dining room has a history that gives us a bit of a problem – in the same way that Sweeny Todd’s history caused those in need of a short back and sides a little anxiety. But there has been a resurgence of fine dining in British hotels of late from the Highlands to the south coast, both in smart city hotels and romantic country lodges. This guide features three of my current favourites. 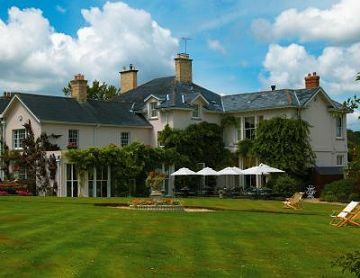 Set the heart of the Dorset Downs, a £4 million refurbishment in 2003 has created this ultra-luxurious small hotel around an original 18th-century house. There are acres of gardens to explore: flower beds and lawns to the front, parkland to the side, and a kitchen garden growing herbs and vegetables behind – always a good sign of a restaurant’s commitment to ingredients.Whilst public rooms have been given a chintzy English country house makeover with open fires, plump sofas and paintings of faithful gun dogs, my bedroom was styled with a clubby, modern theme. Standard kit included a plasma-screen television with DVD, air-conditioning and Internet access. Polished dark wood furnishings and richly textured fabrics were used throughout, and a large window in the bathroom overlooked the garden. Summer Lodge’s restaurant is a comfortable room with floral, padded-fabric walls and a very bourgeois French feel. Executive chef Steven Titman was lured from the highly acclaimed White Barn Inn in Maine, and Alsace-born Eric Zwiebel was Sommelier of the Year in 2004. He has put together a phenomenal list of almost 1,000 bins with, for example, 32 Champagnes. France is very well represented, but there are interesting bits and pieces from every corner of the globe. My stay at Summer Lodge happened to coincide with a Portuguese food and wine evening that kicked off at 7:00pm with canapés and a glass of wine before a very refined four-course dinner. Salt cod with dressed rocket and lemon aïoli was subtly flavoured, with a tang to the dressing that didn’t overpower the flaky, perfectly cooked fish. Gressingham duck came seared on the outside, nicely pink inside, with an aromatic broth of tomato and coriander. This was a sociable occasion, and taking coffee in the lounge after dinner I discovered that many of my fellow guests were refugee Londoners who enjoy regular country weekends at Summer Lodge. That speaks volumes about the welcome on offer here. Dinner £48, rooms from £185 per night, bed and breakfast. 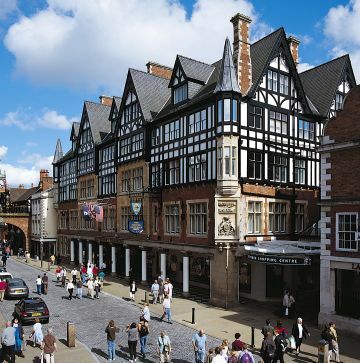 Chester is an absolute jewel of an historic city with a wonderful Roman heritage and delightfully quaint double-decker shops, cafés and pubs housed in the medieval ‘rows’. Dating from 1865, the Chester Grosvenor has history to spare too. Privately owned by the Duke of Westminster, there is something Tardis-like about stepping through into a spacious, five star interior – though with just 80 bedrooms and suites it retains a personal feel. Perhaps having Britain’s richest man as owner helps, but attention to detail is obvious, like the hotel’s two full-time painters who ensure not a flake of emulsion is missing.My room was delightful: ultra-modern in design, with one wall clad in chocolate-brown leather, contemporary bed-linens and funky armchairs, and nice touches like a Bose stereo and complimentary broadband Internet access. The marble bathroom was on the small side, but well appointed, and effective double-glazing meant the hustle and bustle of Eastgate could be seen, but not heard. The hotel’s café/restaurant is a truly authentic evocation of a great Parisian Brasserie, but for fine dining book a table at The Arkle, where Simon Radley is behind the stoves and has retained a Michelin star for 15 years. An intimate but business-like space, a large cupola suffuses the room with light. Sommelier Garry Clarke presides over 600 bins, including astonishing collections of Romanée-Conti and Opus One, but also plenty of good value New World wines by the bottle and glass. My meal here was truly superb. I bypassed the gastronomic menu this time (£65) and instead chose to eat à la carte, where £55 buys three substantial course plus an array of amuses, coffee and petit-fours. Cornish red mullet ravioli came with a summer vegetable broth, and a liberal sprinkling of succulent pea shoots and herbs. ‘Chelford Beef’ is one for the seriously hungry. Beef fillet poached with aromatic herbs and topped with a lobe of seared foie gras was outstanding, but just as my plate was cleared, part II of a multi-part dish arrived: baked treacle short rib; a deliciously sticky, forkable chunk of slow-cooked meat. Thankfully, coffee and chocolates was served in the bar, where comfortable club chairs seemed a reasonable option for a night’s kip, the stairs to bed being at least a further 25 yards away. The Arkle is closed Sunday and Monday. Rooms from £185 per night, bed and breakfast. The Irvine family have run this 13-roomed hotel for 40 years, establishing it as one of the finest country hotels in the UK. 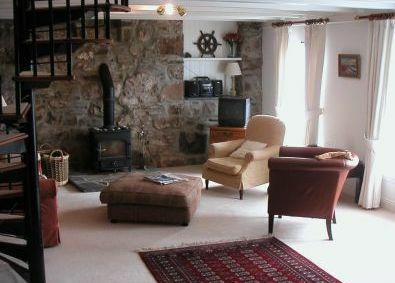 It sits directly on the shore road, with breathtaking views across to the Summer Isles to the Hebrides. I stayed in the newly refurbished Boat House suit, which enjoys uninterrupted views. Whilst modern, the refurbishment has retained the charms of beamed ceilings, exposed stone walls and flagstone floors. Other rooms are in log cabins and turf-roofed cottages, and whilst cheaper, they are showing their age with pine-clad interiors rather absorbing the wonderful west coast light. The Summer Isles kitchen has a Michelin star, and is presided over by chef Chris Firth-Bernard. Scallops, lobster, langoustines or crab from the cold offshore waters feature nightly, along with venison and lamb from the hillsides and big brown eggs from the Irvine’s hens. Delicious breads come straight from the oven, and the 400-strong wine list runs the gamut from £15 southern French and Chilean quaffs, to trophy wines like Pétrus, Romanée-Conti and Screaming Eagle. Though there’s a certain formality about the dining room, this is a place to wear walking boots and wind-cheating clothes by day, and dress up a bit for dinner after a long soak in your over-sized bath. There’s also a busy bar at the side of the hotel, where you can rub shoulders with locals and sample the Skye Brewery’s excellent cask ales, or an array of Island whiskies. The set, no-choice dinner is not cheap at £47, but offers good value for five course, coffee and service. One starter I particularly enjoyed on my two-night stay was a fine fish soup, creamy and light, touched with saffron, and studded with chunks of locally netted salmon, turbot and lobster. Though a haunch of Roe Deer venison was dark and delicious, it was a scintillating poached lobster that stole the main course show. This was an object lesson in simplicity, with copious, impossibly fresh meat presented with minimum intervention. Puddings and cheeses are brought round on trolleys, followed by coffee served in the lounge. By 10:30 we had the place to ourselves: all those hearty hill-walking guests had retired early, no doubt exhausted by the marvellous amount of nothing to do. Closed November – March. Rooms from £130 per night, bed and breakfast.